DETROIT: Something New, Something New……..
Coffee and (____) began life as a pop-up in the West Village neighborhood, it popped-up again last June on Jefferson in the up-and-coming Jeff Chalmers district; the popular coffee shop and bakery has returned to its charming space on Jefferson as a permanent fixture, hooray! 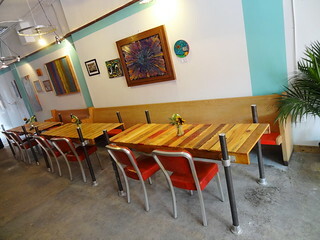 Conferring with Angela, the space was built out last year by the Detroit division of the AIA, she has added her own personal touches such as colorful pillows, potted plants and fresh flowers on the table daily, walls are covered with colorful artwork by local artists. The stars of the coffee shop are, of course, the pastries. Angela is a formally trained pastry chef who knows her way around Key Lime Pie, heavenly scones, gooey chocolate brownies and the best banana bread you’ve ever tasted. Each day a variety of pastries from the full flour, sugar, butter variety to vegan and gluten-free sit under glass domes, tempting all who enter. Let’s not forget the coffee; regular and decaf, drip, espresso or our favorite cold-brew in town, you can have it made to drink in-house or to-go. 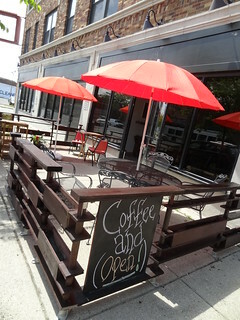 We pull up in front of the shop; the patio has sprung back to life with bright red umbrellas, plants, tables and chairs. Inside, there are open seats at the counter, our favorite place to sit; while Kris takes a seat I eyeball the pastries, it’s no secret I love chocolate—a brownie it is! 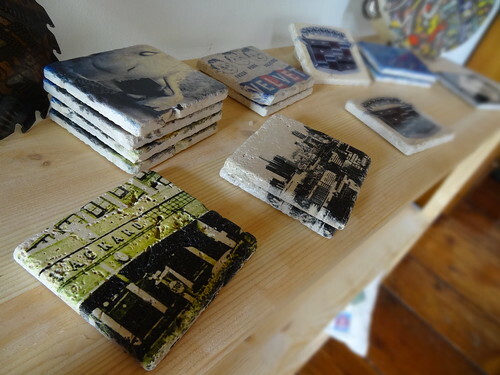 The atmosphere here is very laid back; customers often engage in conversation with one another about this and that. As I devour my chocolately brownie and sip on cold-brew coffee I take in the large paintings that hang on the walls; Kris and I each pick a favorite. 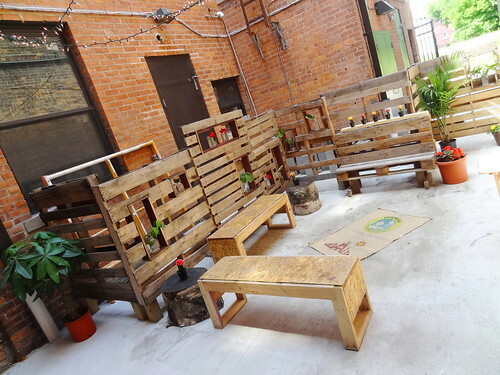 When we have finished, we check out the courtyard in back; benches are made from reclaimed wood, colorful cactus, a money tree and potted palm add color, miniature white lights are strung overhead, it’s truly an oasis. Hello Records second location is taking over the space adjoining Coffee and (____), currently open on weekends, more on that later. 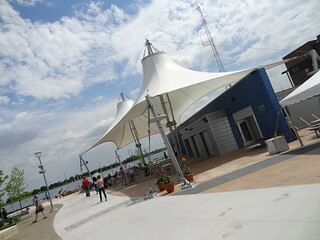 The transformation of the Detroit riverfront over the last few years has been amazing! 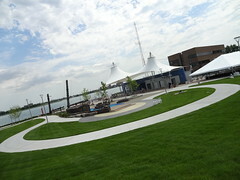 There are now 3 miles of completed pathways, parks and green space making the river accessible to all. 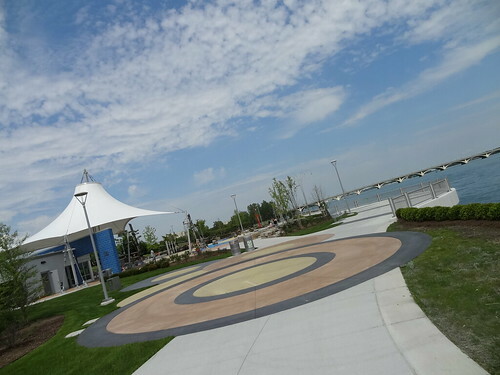 We are visiting the east riverfront; Mt Elliott Park has been completely renovated by the Detroit Riverfront Conservancy to include a plaza, water features, restrooms and a cafe—today is opening day. We follow the freshly poured concrete pathway toward the river, the grass is green and lush, benches are arranged here and there, LED light poles flank the path. 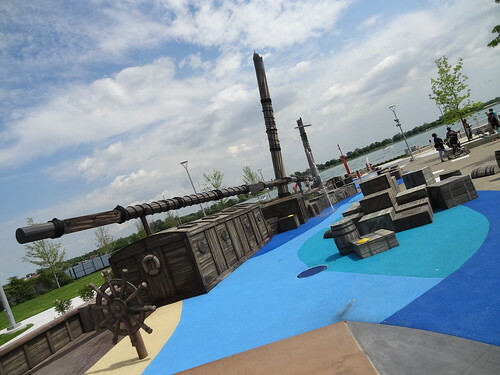 The tented park pavilion is off to the right, but what really grabs our attention is the water feature to the left; a life-size replica of a great lakes schooner appears to have sunk into the plaza, masts poke out from the ground spraying water into the air. As we approach we notice stacks of crates, the ship’s wheel, treasure chests and barrels, all with the ability to give you a soaker. 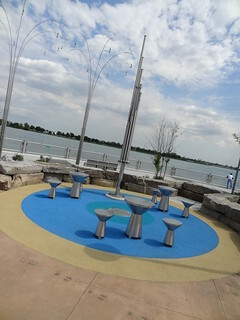 Here a layer of soft material in shades of blue cover the ground, making it user-friendly, I spot a few yellow disks marked with a blue footprint that activate the water flow, it’s really cool! Further on kids are spraying one another with water cannons, jets of water shoot up from the ground intermittently drawing screams and laughter from those who are now wet. 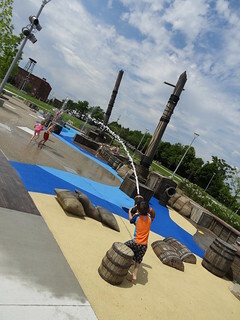 A trio of children hang on to a giant cattail and spin around, further on, wind chimes are ringing in the gentle breeze. As we head to the silver railing that lines the water a small boy bangs on drums, another bangs on pipe-organ-style hollow tubes, the sight of all of this activity brings a smile to my face. 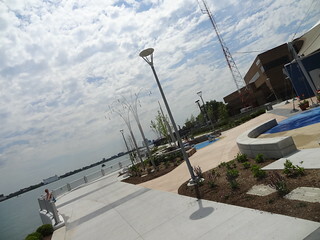 The MacArthur bridge connecting Detroit to Bell Isle is picturesque from this spot. The pathway continues to the right, colorful concrete circles add whimsy to the route, where there is no railing rocks are piled high, where the pathway ends we find ourselves overlooking a Coast Guard boat. 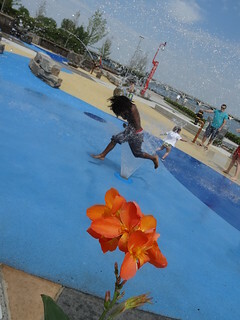 Turning around I am able to take in the entire park; the scene is picturesque, even nicer than I had anticipated, seating is plentiful, flowers spill from large planters, multiple generations are enjoying a little fun in the sun at this most welcomed park. 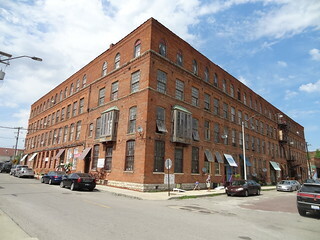 There’s an old 4-story, red-brick building near the park entrance. Kris notices the new awning and balloons over an open door, I fall into step behind him to check it out. The name on the awning says “Fun Shop“, let’s see what it’s all about. 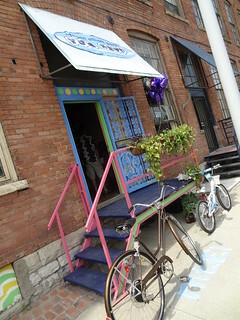 The shop is a combination art gallery, cultural gifts store, snack shop and overall ‘fun’ place. Near the door you can purchase sunscreen, bottles of water and towels, snacks are sold by the register. 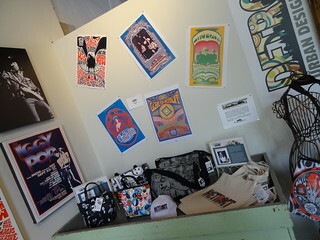 The walls are covered with old posters of names like Iggy Pop and MC5, works by Gary Grimshaw, Carl Lundgren and Leni Sinclair can be purchased here along with t-shirts, bags and jewelry by local artists, indeed, lots of fun stuff. 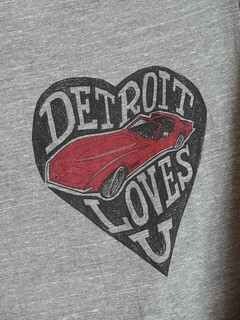 I pay for my really cool Detroit watch and we are off to get some lunch. 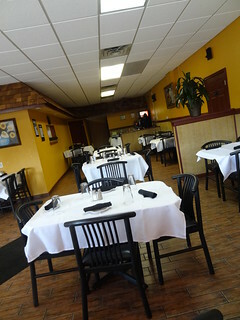 Southwest Detroit seems to be calling us; traveling a little off the beaten path we end up on Springwells at El Asador. A brown brick building with red trim, it’s sits across the street from Vince’s, a well-known Italian restaurant that has been around forever. 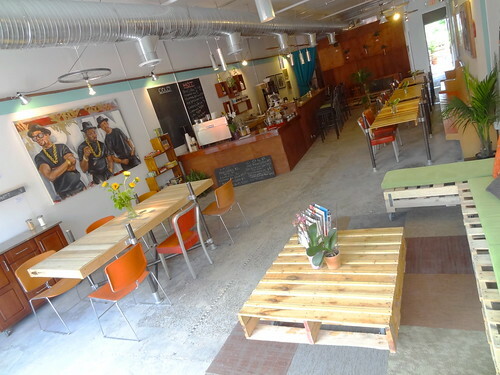 Inside, the walls are painted a golden-yellow, black chairs are pulled up to white tablecloth covered square tables. As usual, we take a table near a window; our server greets us with menus and returns quickly with chips, salsa and glasses of ice water. 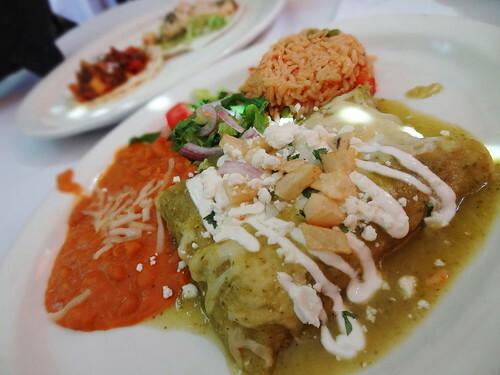 Along with traditional Mexican favorites, the menu concentrates on steak and seafood dishes, it all sounds good. After taking our order, our server returns with a cart which holds a large stone bowl, avocados, tomatoes, cilantro, salt, onions, lime juice and chopped jalapeno’s—-they make the guacamole tableside, awesome! As ingredients are added and softly smashed together we are asked how spicy we like our guac, she continues to add items from small bowls, mixing them in until, voila’, it’s done. The dip is garnished with freshly made flour tortilla chips and placed on our table; immediately we scoop up the flavorful green mixture, wow, it is outstanding! 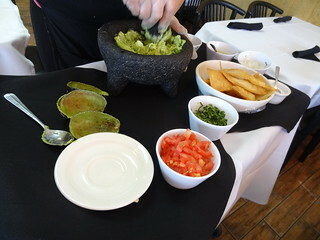 We have never had guacamole so fresh and delicious, you have got to try this. Everything is made fresh to order so dishes do not arrive rapid-fire from the kitchen, but don’t worry, it’s worth the wait. This time we have a chorizo taco, tasty and different from any other chorizo we have had, a lobster taco, delish, served with its own sauce and veggies and chicken enchiladas verde. The enchiladas are moist and flavorful, topped with sour cream and diced fried potatoes, they come with yummy rice and refried beans that are an orange-ish hue, also excellent. The food here is wonderful and unique to the area, service is excellent; next time you have a hankering for Mexican food, you know where to go…….. you’re welcome…….